Scrolling through Pinterest and other places, I have seen little things like this. People are calling them all sorts of things but I am just going to call them "Oatmeal Bites". I have been wanting something healty to just be able to grab when I'm in the mood for something salty or sweet. In some of recipes I've scrolled through, I haven't see many "tasty" ingredients. 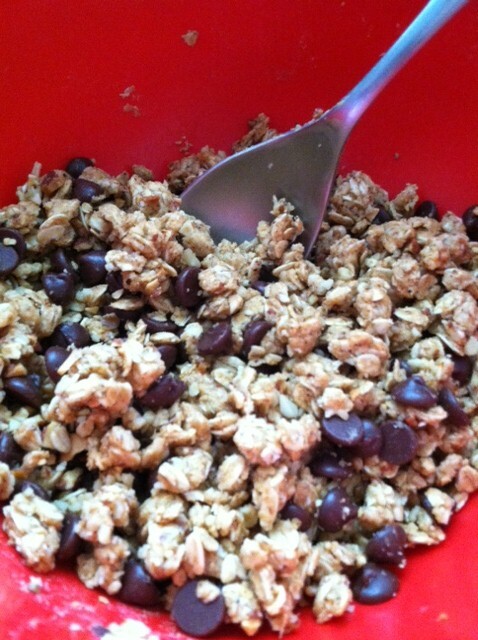 Some of them just have mixtures of nuts that don't sound tasty together, oatmeal, and then some chocolate chips. I decided, if I'm going to take the time to make a healthy little snack, it is going to be healthy and yummy all in one bite!! I had all of these ingredients on hand (rare), so I decided to throw some things together and see what I could come up with. I am very happy with the results, and I hope you like them! I can't wait for my husband to get home from work and my little girl to wake up from her nap to taste them so I can get the real 411 on if they are actually good or not!!! These little snacks didn't last very long! Hadley was eating them like they were pure chocolate and Clint loved them as well!!! Hope ya'lls tastebuds danced like their's did!!! 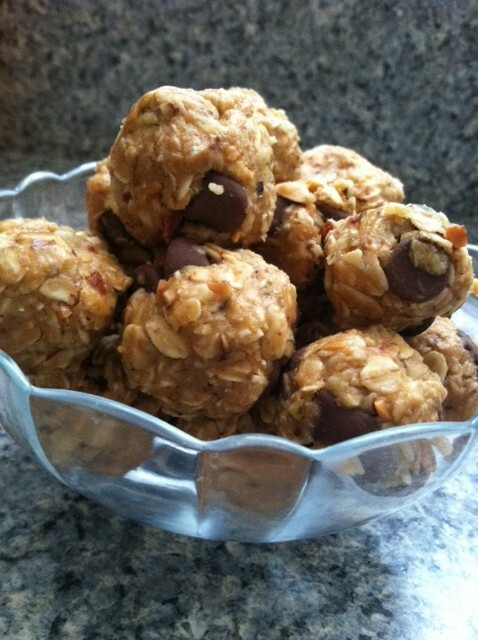 In a small or medium size mixing bowl, combine the oatmeal and peanut butter. Once that is combined, add in the honey. Finely chop or coarsly chop the almonds and walnuts. I ran them through something equivalent to a "Slap Chop". 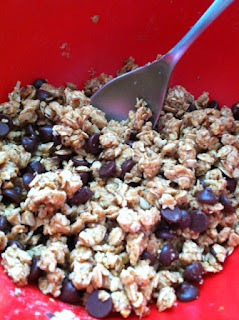 Add them to the oatmeal mixture and combine, then add the chocolate chips. Use a tablespoon measuring spoon and dip out some of the mixture. Flatten it into the spoon to where it's flat on top, this helps it to go ahead and start sticking together. Remove it from the spoon and mold it into a ball. Don't roll it, it will break apart. Squeezing it together and molding it works best. I only ended up with 26 Oatmeal bites in the end because I ate one, or three, before I counted. 28 is a good estimate!!! ENJOY!! !